Can you imagine life without any electronic devices? What if how you say a word or the terms you use could reveal you as a spy and the punishment for that is death? That is the world of Shibboleth. It’s 2055 and America as we know it is no more. The Former USA has broken up into warring regions and each will stop at nothing to gain supremacy. Networks of spies and infiltrators are sent into enemy regions to pass as locals. But these spies don’t use computers or the internet or cell phones. They don’t fly in jets and drive fancy cars. All those things were all destroyed back in 2030. In the catastrophic event called Black Swan, solar flares fried electronics and sent civilization back a century. 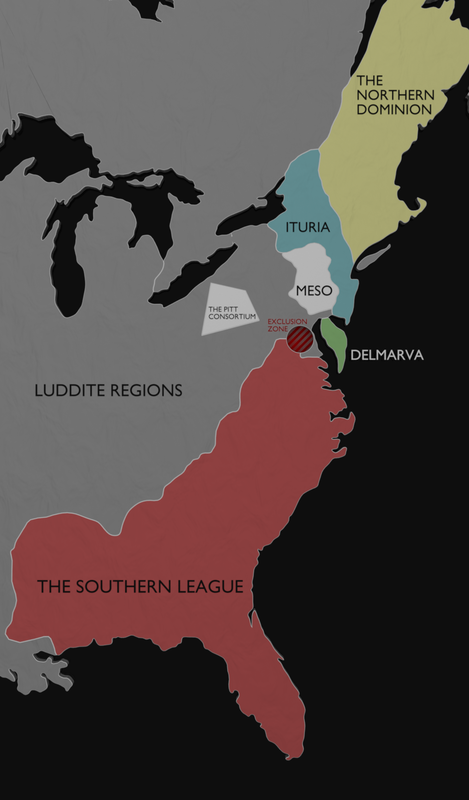 After the former U.S.A. was torn apart by the murderous post-Black Swan Conflicts, numerous warring rival regions were created. Because most airplanes were gone and ground vehicles very limited, regional borders tended to settle at natural boundaries like rivers and mountains. Meso is short for Mesopotamia: the land in the middle of rivers. Where no government was created or none was desired live the Luddites who shun the frantic scramble for technology that consumes the major regions. Now each tries to steal what precious technology remains. Pryz Kestler is one of the new breed of young spies trained to blend into enemy territory and complete her mission. Along the way she finds danger, betrayal, and that the things she never questioned about her world have become her biggest challenges. Want to see which region you belong? Take Meso's infiltrator screening test.